Dr. Visvanathan is a physician-scientist. She is a translational epidemiologist focused on cancer and a medical oncologist. Dr. Visvanathan is Director of the Cancer Epidemiology Track, in the Department of Epidemiology at JHBSPH and Director of the Clinical Cancer Genetics and Prevention Service at the JH Sidney Kimmel Cancer Center. In addition, she is a member of the Breast and Ovarian Cancer Program and Cancer Prevention and Control Program at the Cancer Center. Dr. Visvanathan and her team conduct both observational and clinical trials focused on primary and secondary prevention of breast and ovarian cancer. Her research interests include: 1) improving risk stratification through the identification of breast cancer risk factors/biomarkers involved in inflammation, DNA repair, obesity, methylation, and vitamin D, 2) molecular characterization of breast and ovarian precursor tissue lesions as a target for prevention, 3) evaluating risk reduction strategies for breast and ovarian cancer (i.e oophorectomy, hormonal prevention, sulforaphane, statins, aspirins and non-toxic preventive agents. 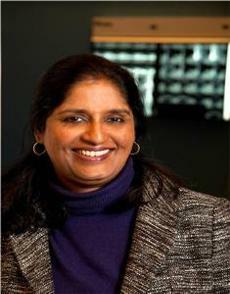 Dr. Visvanathan is an active member of multiple national working groups including the NCI Cohort Consortium, NCCN Breast Cancer Risk Reduction Guideline Committee, ECOG Breast Committee, and NRG co-operative trials Prev/Epi/Beh Committee. Dr. Visvanathan has previously co-chaired a national guideline on breast cancer chemoprevention and a working group on incorporating observational research into guidelines. She currently serves on the Maryland State Cancer Council and chairs the advisory board of the Maryland Cancer Registry.